Location: Porkhovsky District in Pskov Oblast, Russia. 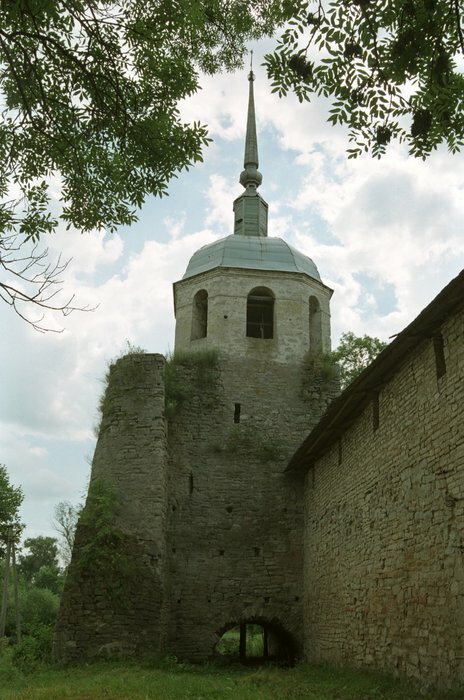 Notes: The fortress of Porkhov is believed to have been founded in 1239 by Alexander Nevsky. The timber fortress was sacked by Algirdas (Olgierd) in 1356 and fell in flames in 1387. The Novgorod Republic immediately rebuilt its fortifications in limestone 1.3 kilometers (0.81 mi) downstream. In 1428, Grand Duke of Lithuania Vytautas destroyed the western wall by artillery fire and entered Porkhov. Two years later, the Novgorodians augmented the fortress and rebuilt its walls. After the fall of Novgorod to the Muscovites in 1478, the fortress lost its military importance. Porkhov was the second most important town of Shelon Pyatina, after Russa. It was not, however, a significant economical center-there were only seventy-six homesteads there in the 15th century and almost all of them were peasant ones. During World War II, Porkhov was occupied by German troops from July 11, 1941 to February 26, 1944 and was a place of a concentration camp.The town of Porkhov, together with Porkhovsky District, was transferred to newly established Pskov Oblast from Leningrad Oblast on August 23, 1944.